Though I was born just a few years after the Indian independence, Gandhi was a remote figure, larger than life and an anachronism. Adulation for the father of the nation and the highlights of his life were common talking points. One learnt the bare facts in school – Porbandar, early marriage to Kasturba, Meat, Barrister at Law, South Africa, thrown out of train, Tolstoy farm, return to India, resonance with the common man, widely accepted, long walks, spinning yarn, cleaning toilets, Ahimsa, Swadeshi, England Round Table, Swaraj, Quit India, riots in Noakhali, fasting, jail, Salt Satyagraha and Independence… and assassination, unrepentant Nathuram Godse. I encountered Gandhi at every turn and slowly got to understand what he represented and the picture emerging from the mist of seemingly unconnected matters slowly gathered some coherence. I say some, because I am not sure yet if my picture is fully coherent or if I can say that I have understood Gandhi fully. However there are strands that hold together pretty well under examination and re-examination. I will share some of these below. There are questions that have refused to go away – I will share these also. I can only imagine, as possibly you have done, what a dilemma it would have posed for a well-educated upper class gentleman to be thrown out of a train, most unceremoniously at a wayside railway station because he was coloured. The unfairness of the system and its force, must have posed a tremendous challenge. One had to stand up and possibly succumb or one had to stand away from the method of ‘might to crush the opponent’. Here possibly was the acid test – when the problem came to his own door it acquired an urgency. It is still argued whether Gandhi saw ahimsa and non – violence as strategic tools or whether he was deeply compassionate. To me it is futile to argue this point. If his strategy was so deep that he refused to lift a hand to protect himself when the lathis rained blows and cleaned toilets in Harijan homes, it was a lesson in commitment. If his actions sprang from a compassionate response that refused to look upon the British as enemy, it was a remarkable demonstration of deep and unusual courage. Gandhi’s tools and life, both internal and external, fascinate me. I learnt to spin the takli in my early forties in the weaving room of a school where I worked. It took almost a full day of diligent relentless practice to master the art of making thread out of cotton. 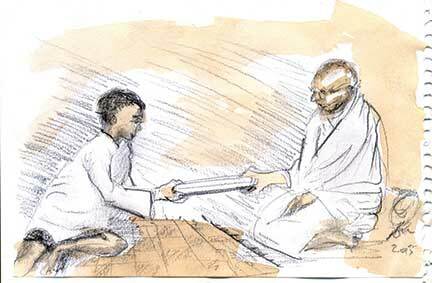 This simple act connected me to the generation that had seen Gandhi and had spun on the streets and spurned foreign cloth. I grew proficient at spinning and as I practiced, the takli began to sing and it told me extraordinary stories. It told me how, something like cotton, so weak, so diaphanous, can easily become a thread that is strong. Bringing together weak fibre with the spin of one hand and the stretch of another can yield something so wondrous as a thread. This act connected me to societies and civilizations that spun cotton, wool, and other fibres. Children in the weaving group were sent to me to learn spinning and I heard another silent song. As the eye watches the yarn and the fingers check the strength of the thread, we can share stories and continue to engage with each other, listening, speaking, and reflecting. As you spin yarn, you can speak. Our speech is a story, another yarn, carried over from the cotton wisps of yesterday. Our life is a yarn spun out of the inherited yesterdays, fuelled by contexts and experiences. One single thread by itself is still a weak thing. The yarn from many hands, woven together by the clack-clack of the loom acquires another shape… a participatory fabric, much as our individual stories become the participatory fabric of society. The woven cloth has extraordinary strength, even if it is the fabled muslin from Dacca (now Dhaka). It can be washed, beaten and pulled and yet holds its shape while being pliable. Unstitched cloth holds all manner of possibilities – saree, dhoti, sheet, and a myriad other uses. Gandhi, understanding industrialization, possibly saw the need for individuals to claim their birthright to participation, not only intellectually but practically, physically in weaving the participatory fabric. Spinning yarn can bind people with shared simple action. When I spin, I do not see the end result. The yarn bundle is a small thing, when added to others’ bundles it becomes fabric in the weaver’s hand. We need each other and we need to share. We need to share without thinking if my yarn is bigger, better, stronger than yours! This could be the basis of an inter-dependent and local community that draws its needs and flourishes, one where relationships matter and people recognize each other as fellow yarn spinners. I spun the takli watching television and found the mesmeric hold of the small screen broken. One could attend to the takli and the screen images simultaneously. Not only did the physical action rescue me from being a mere consumer of canned images, I experienced the dignity of participation. And I wondered, if the humble takli, in modern day India could energize our role as actors and not merely recipients, thus bringing consciousness of community into our lives. 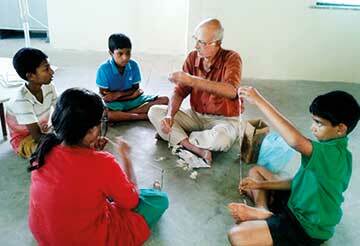 Anyone can spin a takli, irrespective of age, gender, or any other social attribute. As a teacher I have often wondered if injustice exists because people refuse to take stands, but remain mute, scared spectators. Would I resign if I was asked to beat someone and I was clear this is wrong! If children have been beaten in school, it is because teachers have accepted that subjugation through force is the way. We all know that use of force attracts its own reaction. And yet we continue. Could violence, aggression, dominance through fear and power be left behind by a large number of people? The third strand of Gandhi is particularly relevant to the educated Indian. By quoting Gandhi and wearing khadi clothes, we have sealed the old fragmentations in Indian society far better than any king or ruler could have done. We depend on a large number of individuals for services. We exercise our economic right to these services. However, we do not recognize these individuals as people who are worthy of our shared rituals. We restrict our egalitarian sensibilities to contexts overseas where we thank the waiter, watchman, and cook. At home they are not worthy of sitting together and eating with us. And of course we would never dream of cleaning toilets in a slum or a basti, that was reserved for a quaint piece of history called Gandhi. Unfortunately ahimsa remained a strategic tool for navigating the British rule of India. Possibly many were touched by the other worldliness of this man who refused to retaliate, hit back or aggress. But in this adulation, there was also the distancing. ‘Gandhi can do it, I cannot!’ He became the Mahatma, unreachable. And we disowned our own responsibility. Are we willing to take the leap of faith into non-retaliation? Or is it impossible, individually, collectively, nationally? Are we willing to find avenues of participatory action that are not just intellectual but binding a deeper human predicament? Lastly, what kind of society do we want? One where injustice, even to one person, is a blemish on governance? Or one where we steel ourselves and accept as collateral damage, injustice to millions as unavoidable, where justice for all is a surrendered hope? Do we want rampant consumption, or do we want to listen to Gandhi who said, ‘There is enough for everyone’s need but not enough for one person’s greed.’? This world is not meant for someone as beautiful as you…. In Pathashaala, a small new school where I work, we use dry composting toilets and harvest compost on 2nd October as a small tribute to a man who refused to allow another to do for him what he would not do for himself. It is an educational and life changing experience to see our waste converted to rich and fragrant compost. The author serves as Director – Secretary of Palar Centre for Learning – KFI responsible for a small school called Pathashaala near Thirukalukundram. He was Principal at The School, KFI from Feb 1991 to May 2012. He can be reached at gautama2006@gmail.com.